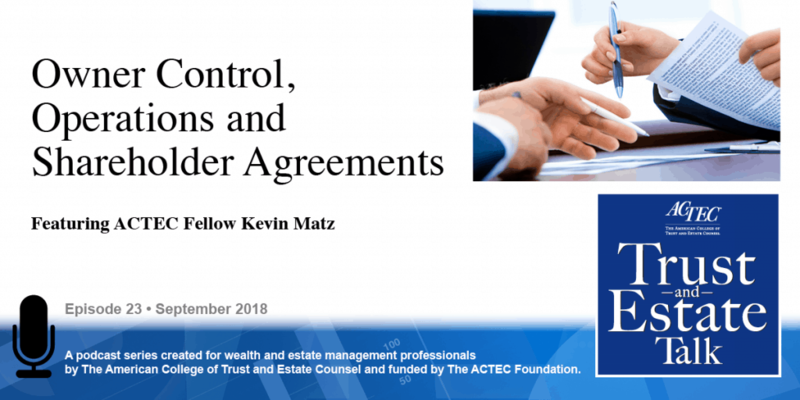 “Owner Control, Operations, and Shareholder Agreements.” That’s the subject of today’s ACTEC Trust and Estate Talk. This is Susan Snyder, ACTEC Fellow from Chicago. 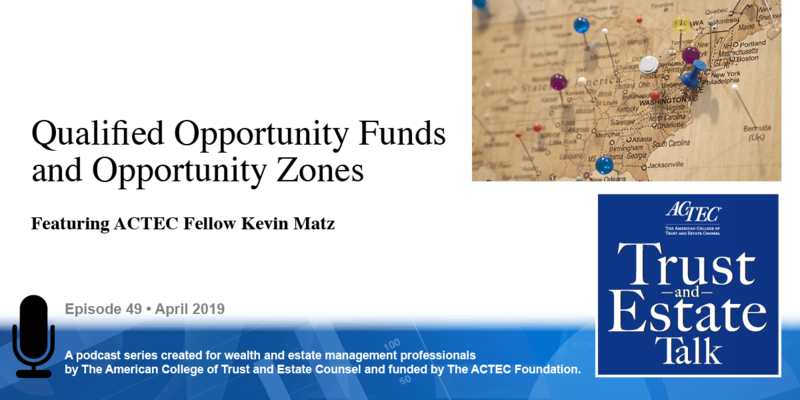 “Owner Control, Operations, and Shareholder Agreements.” To learn more about this topic you will be hearing today from ACTEC Fellow Kevin Matz of New York City. Welcome, Kevin. Well, thank you, Susan. So, we’re going to talk today about buy-sell agreements and planning for it. And that is a very complicated area of the law, because not only are you bringing to bear knowledge of the legal environment and tax, but you’re also bringing to bear a psychology and working with people, working with business owners. 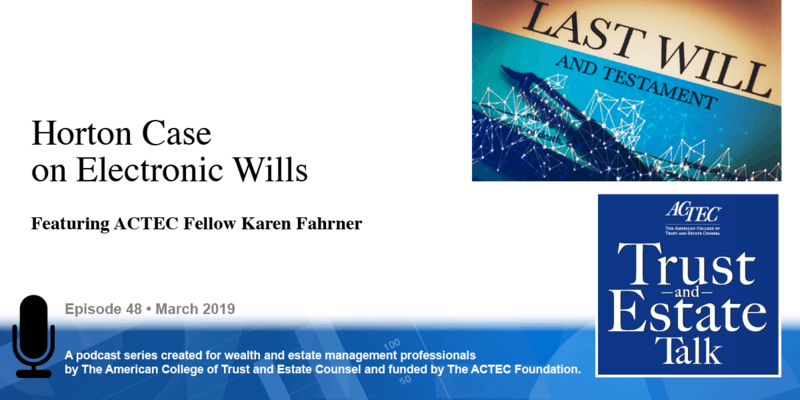 Business owners who really don’t have a sense – yeah, they kind of get it, but they don’t fully understand that at some point they will die, and they have to have a succession plan for their business, and interweaving estate planning with succession planning. And also you talk to business owners about dying. You know, there are other topics too that relate there. What if they become disabled? What if it’s a temporary disability or a permanent disability? How do you plan there? So, that’s the nature of the discussions that we have; a lot of it is really psychology. 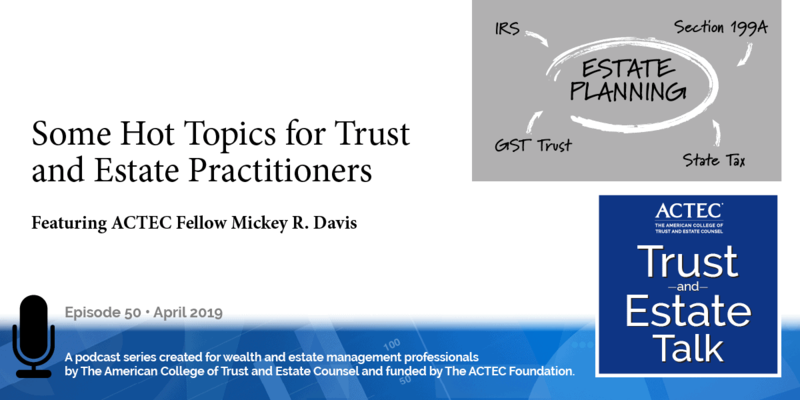 The hardest part – you can lay out the standards, you can then interweave the tax – time permitted, I talk more about Section 2703, which governs valuation for estate tax purposes of buy-sell agreements and whether or not they will be effective for estate tax purposes, time will not permit, but that is part of the analysis. And part of the steps involved, you’ve really got to focus on the psychology of the client. So I say first off the most important thing right off the bat is who that client is. So, is it the entity? In which case maybe you’re telling everyone who is an owner they should get their own separate counsel. Or is it the senior family member who’s brought you in? You have to be very, very clear as to that. Extremely clear, because if you’re not, it could raise ethical issues, it could create uncertainty, it could raise possible liability-type concerns. So, first you have to identify who that client is. And let’s say it’s a senior family member, let’s just go with that. You have to have frank discussions. Frank discussions along the lines of, “OK, you have two children here, one of them seems to be very much involved in the business; one of them is not so involved in the business. One of them may be married to a son-in-law or a daughter-in-law you’re not too fond of.” We have to think of various permutations of what could happen. What if someone wants to get out during your lifetime? Someone wants to transfer their interest. Are there going to be any restrictions on transfer? Can they just sell it to a third party? Can they transfer it to family members, including a spouse? Or do you want some sort of limitation under the terms of the agreement that basically says, “No, you can’t do it unless maybe you have a subject to a right of first refusal by other interest owners who can just go ahead and buy you out at perhaps the offered the price.” So, you have to think of those terms to restrictions on transfers, keeping in the family, and then defining what do you mean by family? You know? Not all children, grandchildren are equally capable of stepping into roles of business owners. If father were to die, if the senior family member were to die, well, those issues come to bear too. So let’s say it’s a situation, senior family member owns the lion’s share of the interest, and there are two kids, and he wants economically to provide for them equally. But one of the children is much more involved in the business than the other – much, much more. Do you provide equally for both of them in equal shares so that there may be a stalemate in operations going forward? And a stalemate that will essentially cripple the business? That is a major, major concern. Or do you provide otherwise? Do you maybe try to provide economically the same, but you give a voting interest to one child who seems to be very much enmeshed in the operation of the business. And give something else, maybe there’s another pool of assets; maybe there’s life insurance; maybe there’s a pool of assets funded by life insurance or other liquid assets that could be used to fund some sort of equivalent type bequest under the terms of one’s will or estate planning documents to the other child. That has to be considered, because you really, when you’re meeting with the client, Susan, you really have to be very clear that, here’s a scenario: you’re no longer here, it’s your kids – and maybe there’s a spouse too, providing via a QTIP trust to the surviving spouse – how are things going to work? How are things going to play out? And what is needed to make sure it doesn’t go off tracks, because we hear the stories. There are so few businesses that make it down a generation and then even fewer – so few – that may get down two. What can we do to buck those odds? We need to really provide, let’s say your family member, our client, with realism there. And then, that’s a starting point; once we have that, we then consider whether or not there are existing interests that are already held by the younger generation family members. Whether to bring them in, maybe suggesting that they have their own counsel because otherwise they think that I’m the lawyer, and I’d be very clear with them that I’m not, but no matter how clear I am, and I always want to document things with an Engagement Letter, and even though my letters may say, “Understand that I’m not you’re lawyer,” I want to be very clear that they know and have in writing that I’m suggesting that they get their own lawyer to look at this. And that’s something that has to be considered. Sometimes you’ll mention that to the senior family member and they’ll say, “Oh, I don’t want them to have their own lawyers and come into this with their own lawyers and all of a sudden we’re going to negotiate. This is my business! I control this!” That, again, you have to have those discussions. And one more thing, one parting item for this podcast I’d like to mention. It’s great for your client to put together a very elaborate plan. And let’s say a client decides, “Well I’m going to deal with it mostly for when I die, and whatever my will says, that’s going to be it. Maybe I’ll have in terrorem clauses. Maybe I’ll have two different funds here, have a life insurance with a reputable life insurance trust with a private side fund so this way you get an economic equivalence.” But communication is the key because, what’s going to happen if this isn’t communicated to the children in this situation? Senior family member dies, and one is going to be very pleasantly surprised or maybe not surprised; maybe that’s going to be the expectation. The other is going to be very disappointed. And not just disappointed, but disappointed coupled with surprise, but here, not in a good way. And that could wreak havoc as far as family relationships going forward. Of course as a lawyer you’re, basically, you’re the one to blame according to them; of course, you have to be mindful of that. But that is a major concern, and how do you possibly avoid it? 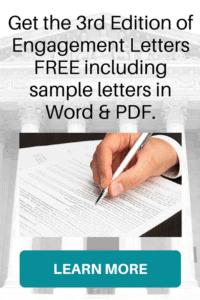 Not to say it’s necessarily avoidable, but what you do is you have to communicate, or at least suggest to your client that he or she make very clear during the client’s lifetime that these are his or her wishes and that the purpose of one’s estate planning documents and buy-sell agreements, since they’re incorporated, is to achieve that result. Thanks, Kevin, for your best practices on buy-sell agreements.